My purpose of drafting this letter and submitting this Peace Proposal is to present an accommodating solution to the continuing conflict in the Middle East; as I see it, there will be no true peace in the world until the Israeli-Palestinian conflict is resolved. This is one of the most important issues of our time and the first step to a world that can accept lasting peace. I am not a scholar or a philosopher, I do not belong to a particular religious faith, nor do I represent a particular political party in my beliefs; what I am is just one human being that respects the rights of all human beings to live in peace and to prosper. I have no enemies and I court no friends. There is not an agenda to my Proposal, merely a suggestion for a path to peace. Something must be done, or we, as the human race, will face further wars and conflict as it pertains to these issues. Surely intelligent beings have the capacity not to destroy one another. Beginning with the issue of Jerusalem; archaeology indicates that this ancient city was first inhabited during the 4th millennium BC, near the only perennial stream there, the Gihon Spring. The first evidence of an urban settlement, in the shape of fortification walls, dates from the 18th century BC, corresponding to the Middle Bronze Age; also at this time, Jerusalem is mentioned in the Egyptian “execration” texts when the Egyptians ruled Canaan. During its vast history, Jerusalem has been destroyed twice, besieged 23 times, attacked 52 times, and captured and recaptured 44 times. Jerusalem is a holy city to the three Abrahamic religions – Christianity, Islam and Judaism. Despite having an area of only .35 square miles (0.9 km2), the city is home to many sites of religious importance, including the Temple Mount, the Dome of the Rock, the Al-Aqsa Mosque, and the Church of the Holy Sepulchre. Based on these facts, no single faith or people can claim the right to total control of the city; and as we know, up to this point in history, it has been imperative that the city of Jerusalem be the capital to both, Israel and Palestine. So, I purpose the creation of a new country called the Kingdom of Jerusalem. This is also in agreement with the recommendations of the UN General Assembly, as it pertains to the city of Jerusalem, in which Jerusalem would be placed under a special international regime, a corpus separatum; further, this recommendation is in accordance with United Nations General Assembly Resolution 194, published on December 11, 1948. The Kingdom of Jerusalem will consist of the territory known as the West Bank, including all of East Jerusalem. The Kingdom of Jerusalem agrees to accept all religions, equally, including, but not limited to, Christianity, Islam and Judaism; and does not have any ties to the former latin Kingdom of Jerusalem, which lasted nearly two hundred years, from 1099 to 1291. By beginning a new country, in the Kingdom of Jerusalem, there is a real possibility for peace in this holy city. Peace must begin first in the city of Jerusalem; a city and land for all the world, not for just one people or religion. In this document, I also purpose the creation of a new Palestinian state, an independent country that reserves all rights afforded other free countries. Palestine will consist of the Gaza Strip and land in the Sinai; and if Jerusalem is chosen as the capital of Palestine, an open thorough way (i.e., tunnel) from the Gaza Strip to East Jerusalem. The Palestinian people in the Gaza Strip can trace their ancestry back to the Philistines, which derives from the attested Illyrian locality Palaeste, whose inhabitants were called Palaestīnī; the Palestinian people first appeared in the southern coastal area of Canaan (Gaza) at the beginning of the Iron Age (1175 BC). The territory of the Gaza, has always been Palestinian land, never been conquered, and should be under the complete authority of the Palestinians. 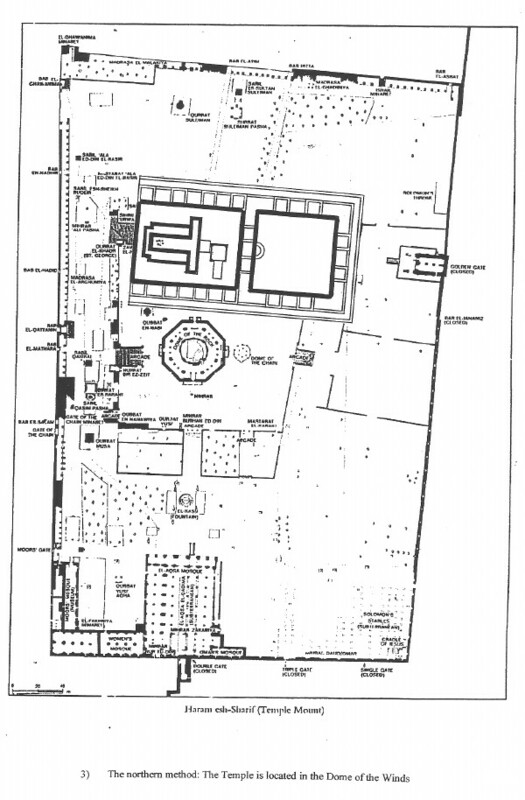 I also propose the building of the Third Temple on the Temple Mount. First and foremost, it is explicitly agreed by all parties, that no harm will be done to the Dome of the Rock, the Dome of Ascension, the Dome of the Chain, or the Al-Aqsa Mosque. The Kingdom of Jerusalem, Israel and Palestine will agree to this building, as architecturally described in the Book of Ezekiel. The Dome of the Tablets / Dome of the Spirits stands directly over the original site of the Holy of Holies in Solomon’s temple; this location is well over 100 yards north of the Dome of the Rock. The Third Temple will stand facing east, built in a straight line towards the now sealed Eastern Gate (Golden Gate); when completed an easement of 150 feet will exist between the buildings; no sound will be heard between buildings. Lastly, in my proposal, I objectively try to resolve some of the ongoing issues that have continued to derive major conflicts; such as, the Golan Heights, the Blue Line, Shebaa Farms, the Strait of Tiran, and the water rights. Also, wherever possible, I have tried to be fair and use natural boundaries, such as rivers, to demarcate borders. To come to peace, it is evident that all parties must compromise to some extent, but all parties should also benefit. Compromise has always been at the heart of true peace and I hope by presenting these ideas, there will be a new transformation and countries will elevate their views in this matter. Surely, we all can live on this planet peacefully. Thank you for your time and consideration. May God bless all the people of the Middle East. Peace is on the way. In 1872, Jerusalem became an independent province, with a special administrative status. “Jerusalem Eyalet” referred to by the British consul as creation of “Palestine into a separate eyalet”; an eyalet is translated as a province or governorate. Jerusalem is situated at a strategic location between Egypt, Syria and Arabia, and the birthplace of Judaism and Christianity, this region has a long and tumultuous history as a crossroads for religion, culture, commerce, and politics. Consequently, the West Bank will become the sovereign Kingdom of Jerusalem. The Kingdom of Jerusalem will be established with borders identified by the Green Line; the Green Line refers to the 1949 Armistice Agreements and in agreement with United Nations Security Council Resolution 242 (S/RES/242), adopted on November 22, 1967, in Chapter VI of the UN Charter. 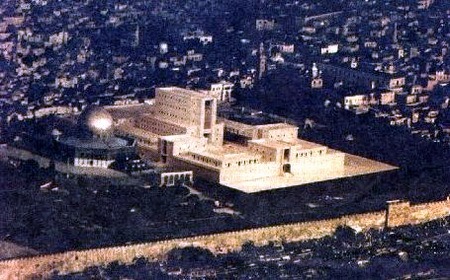 In agreement with the recommendations of the UN General Assembly, as it pertains to the city of Jerusalem, and in order to preserve the peace, given the unique spiritual and religious interests in the city (and territory) among the world’s three great monotheistic religions; “in view of its association with three world religions”, and to be “accorded special and separate treatment”. United Nations General Assembly Resolution 194, published December 11, 1948, established a United Nations Conciliation Commission and reaffirmed these statements. United Nations General Assembly Resolution 303 confirmed the decision to place Jerusalem under a permanent international regime according to the direct provisions of General Assembly Resolution 181(II). Peace must begin in the city of Jerusalem. The Sinai Peninsula is the least densely populated area in the entire Middle East; the Shamal Sina (North Sinai) and Ganub Sina (South Sinai) consist of 21,000 square miles; approximately 100,000 people live in South Sinai and 400,000 live in North Sinai; with a population density of a little over 20 people per square mile. Being on the frontier between Africa and the Middle East makes the Sinai an ideal location for militant factions; this desert peninsula has been plagued with lawlessness. I propose that the lawlessness is due to the population density; lack of people in the Sinai is having a detrimental effect on the area. Given this fact, among others, I propose establishing the country of Palestine in the northern Sinai. Sinai is the only territory that could be easily opened to the Gaza Strip. It should be understood, that unless the Palestinians and the Israelis have more land, there will always be conflict; so I believe that these continued conflicts can be resolved by utilizing the vast area of the Sinai; and the Kingdom of Jerusalem is only possible, if both Palestine and Israel acquire more land. So, the Sinai will be split between Palestine and Israel, with the northern-most section being Palestine and the southern-most section being Israel. It is also imperative that Egypt be given the best chance for the survival of a democracy; the Sinai can be very instrumental in accomplishing the most immediate economic growth, in the form of increased levels of aid from the US and increased commerce interests with Israel, Palestine and the Kingdom of Jerusalem. 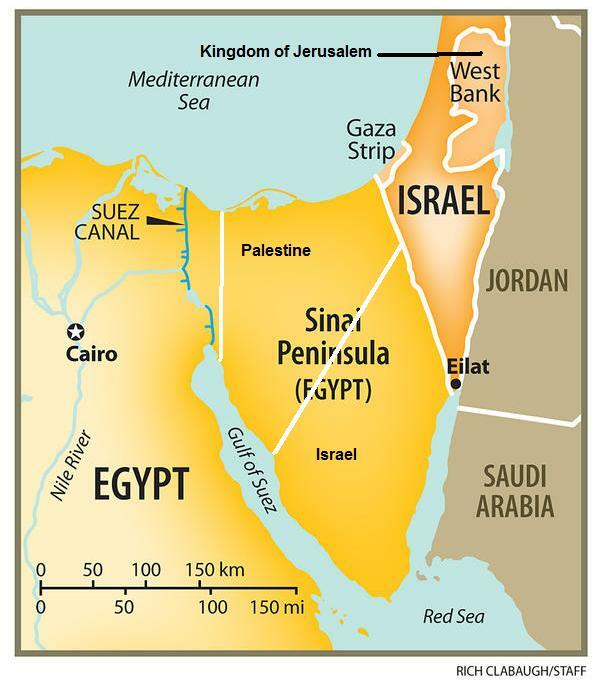 Also, Israel and Palestine will agree that Egypt will retain all mineral rights in the Sinai; and Egypt will still retain the Suez, Ismailia and Port Said Governorates; a buffer zone for uninterrupted passage through the Suez Canal. The first clear use of the term Palestine to refer to the entire area between Phoenicia and Egypt was in 5th century BC Ancient Greece; also by the Roman province Syria Palaestina, the Byzantine Palaestina Prima and the Umayyad and Abbasid province of Jund Filastin. Boundaries of the region have changed throughout history, and were last defined in modern times by the Franco-British boundary agreement (1920) and the Transjordan memorandum of September 16, 1922. I propose the creation of Palestine. Palestine will include the Gaza Strip, along the 1949 Armistice Agreement Line; and proceed south from Rafah, following the former North Sinai Governorate border, to Nitzana, near the Path of Peace; proceeding in a straight line to Nekhel; then a straight line on to Abu Rudeis; going north from Abu Rudeis along the Gulf of Suez; following the eastern borders of the Suez, Ismailia and Port Said Governorates. Palestine can establish their capital in the former North Sinai Governorate, such as Al Arish, or they can choose Jerusalem as their capital. If Jerusalem is the capital of Palestine, an open Palestinian thorough way (i.e., tunnel) will be built from the Gaza Strip to Jerusalem. Portions of the study, The Arc: A Formal Structure for a Palestinian State, as submitted by the RAND Corporation in 2005, will be completed. The Arc would link the Gaza Strip, including Gaza City and the Gaza Airport, to the Kingdom of Jerusalem; from the Gaza airport to Jerusalem will take an hour, from Gaza to Jenin, in 90 minutes. The Kingdom of Jerusalem, Israel and Palestine will agree to the building of the Third Temple. 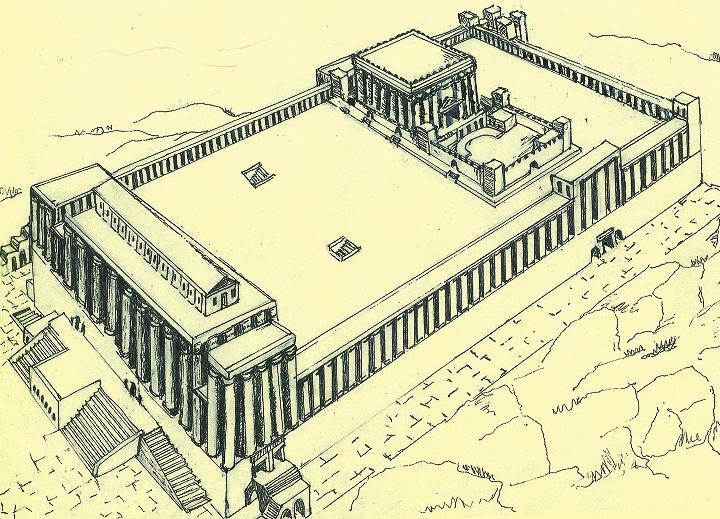 The Third Temple, or Ezekiel’s Temple, as architecturally described in the Book of Ezekiel, will be built next to the Dome of the Rock – as it stands currently on the Temple Mount in Jerusalem (Figure 1). This agreement is with the explicit understanding, by all nations, that no harm or destruction will ever come to the Dome of the Rock, the Dome of Ascension, the Dome of the Chain, or to the Al-Aqsa Mosque. The Third Temple will be built 100 yards (322 feet) north of the Dome of the Rock and straight opposite the Eastern Gate (Golden Gate); facing eastward toward the Mount of Olives. There is exactly enough room for the temple to be built, with the Holy of Holies directly over the Dome of the Tablets / Dome of the Spirits. An acceptable easement, with a clearance of at least 150 feet, will exist between the Dome of the Rock and the Third Temple. All modern sound blocking technology will be used to establish a complete sound barrier between the Dome of the Rock and the Third Temple; an invisibility barrier will completely block viewing into the other worship compound. Two private transit systems (i.e., tunnels) will be created to move worshipers from Western Jerusalem to the Jewish Quarter and to the Third Temple, and to move worshipers from the Muslim Quarter to the Dome of the Rock and the Al-Aqsa Mosque; with this system, no contact will be required between worshipers of each faith. The Kingdom of Jerusalem will consist of all the territory, known, as the West Bank, along the 1949 Armistice Agreement Line; all individuals who choose to live in this area must become citizens of the Kingdom of Jerusalem. The Kingdom of Jerusalem does agree to accept all religions equally, including, but not limited to, Christianity, Islam and Judaism; and to grant full access to all religious sites. The elected government will include a full representation of The State of Palestine; elections to be expedited, to support a democracy. East Jerusalem, along the 1949 Armistice Agreement Line, will be the capital of the Kingdom of Jerusalem; West Jerusalem will be the internationally recognized capital of Israel. The capital of Palestine will be in the former North Sinai Governorate, or in East Jerusalem. US and Israel will agree to build a wide and unhindered thorough way (i.e., tunnel) between the Gaza Strip and East Jerusalem; this project will fall under the direct supervision of Palestine and the Kingdom of Jerusalem. This transit passage (i.e., tunnel) will begin at Rafah, passing through Israel (unchecked), entering the Kingdom of Jerusalem at Meitar; from Rafah to Meitar, the passage will be part of Palestine; Meitar to Jerusalem, the passage will be part of Palestine and the Kingdom of Jerusalem (i.e., The Arc – Rand Corp 2005). US will agree to aid the Kingdom of Jerusalem in an amount equal to or greater than 10% of the aid it provides to Israel; the Kingdom of Jerusalem will be seen as a newly developing country, a country of strategic importance to the US, and a country recovering from war. US will agree to aid Palestine in an amount equal to or greater than 10% of the aid it provides to Israel, most of the initial major contributions are to be fully utilized in the repartition efforts of the Palestinian people, to either, Palestine or the Kingdom of Jerusalem. Israel will agree to aid in the economic development of the Kingdom of Jerusalem and Palestine and their duly elected governments. Egypt will agree to release all territorial claim to the North and South Sinai Governorates; with a total loss in land area of about 4%. US, UK and Saudi Arabia will agree to pay Egypt a total amount of $2.1 billion for the Sinai, equating to $100,000.00 per square mile. Israel and Palestine will agree that all oil, natural gas and any natural reserves in the Sinai Peninsula will remain the property of Egypt. US will agree to continue the existing annual levels of Foreign Military Financing to Egypt; and to honor the commitment of economic aid of $1 billion in support of a democracy; agreeing to resume annual economic aid to levels of 1998, if not to be increased. Israel and Palestine will agree to buy equal amounts of oil and natural gas produced in the Sinai. Agreeing to purchase these resources at 5% above the market rate; and will commit to the immediate economic development of Egypt (i.e., trade, food resources). Egypt, Israel, Jordan, Lebanon and Syria agree to compensate Palestinian refugees that repatriate, for existing assets and all property. The Kingdom of Jerusalem will agree to full citizenship for Palestinians that can show former family residence inside the West Bank. The northern portion of the Sinai Peninsula will be part of Palestine; Palestine borders will include the Gaza Strip, along the 1949 Armistice Agreement Line; proceed south from Rafah (along the former North Sinai Governorate border) to Nitzana, near the Path of Peace; proceeding in a straight line to Nekhel; then along a straight line to Abu Rudeis; proceeding north from Abu Rudeis along the Gulf of Suez; then following the borders of the Suez, Ismailia and Port Said Governorates, providing a buffer zone for the Suez Canal. Palestine will be divided proportionately to all the Palestinian people which choose to live in Palestine; including any and all refugees, the existing Bedouin population of the Sinai, and any other people that chose to remain living in Palestine (i.e., Egyptians, etc.). Palestine will be governed by an elected government of Gazans, Sinai Bedouin. Hamas and Israel will agree to peaceful co-existence. Palestine will agree to release claim to the West Bank, allotted in the 1948 UN Partition Plan; to become the Kingdom of Jerusalem. US will agree to assist Palestine in the immediate establishment of the most effective economic and efficient agricultural growth. Palestine will be seen as a developing country, a country of strategic importance to the US, and a country recovering from continued war. The southern portion of the Sinai Peninsula will be part of Israel. The border with Palestine will include the Gaza Strip, along the 1949 Armistice Agreement Line; proceeding south from Rafah (following the former North Sinai Governorate border) to Nitzana, near the Path of Peace; proceeding in a straight line to Nekhel; then a straight line on to Abu Rudeis. At Abu Rudeis, their border will turn south and proceed along the Gulf of Suez, the Red Sea, then turn north along the Gulf of Aqaba, and to the existing border with Jordan. The Kingdom of Jerusalem, Israel and Palestine will agree to the building of the Third Temple, as architecturally described in the Book of Ezekiel. The Third Temple will be built 100 meters (322 feet) north of the Dome of the Rock; with explicit understanding, from all nations, that no harm will come to the Dome of the Rock, the Dome of Ascension, the Dome of the Chain and the Al-Aqsa Mosque. An invisible sound and sight barrier will be created between the Dome of the Rock and the Third Temple; no sound or sight will be between the buildings; worshipers will not be required to have any contact with those of another faith; transit passages (i.e., tunnels) will be built from the Jewish Quarter to the Third Temple, and from the Muslim Quarter to the Dome of the Rock and the Al-Aqsa Mosque. The Kingdom of Jerusalem will agree to the building of a wide and unhindered thorough way (i.e., tunnel) between West Jerusalem and the Jewish Quarter; this passage will be part of Israel; the construction will be supervised by Israel and the Kingdom of Jerusalem. Israel and Lebanon will agree to a border of the Blue Line, published by the UN on June 7, 2000; Shebaa Farms will be in Lebanon; both will agree to the abide by the Cyprus-Lebanon maritime boundary of 2007. Hezbollah and Israel will agree to peaceful co-existence. Israel and Syria will agree that their border will be the Hasbani River, to the Jordan River tributary, through the Nahal Qallil to the Jordan River, to the mouth of the Jordan River into the Sea of Galilee, and along the eastern-most coast of the Sea of Galilee to Ma’agen. Israel and Jordan will agree to a change in border, which will now start at the Jordan River flowing out of the south Sea of Galilee. Jordan and Syria will agree to a change in border; from the Yarmuk River, along the 1949 Israeli-Syrian Armistice Line, to Ma’agen. Israel, Kingdom of Jerusalem, Lebanon and Palestine will agree to ratify The Convention on the Law of Non-Navigational Uses of International Watercourses (adopted by the UN on May 21, 1997); Israel agrees to share their desalination technology with these nations. Egypt and Sudan will agree their border will be the 22-degree line; Hala’ib Triangle will be in Egypt and Bi’r Tawīl will be in Sudan. Jordan and Saudi Arabia will agree to divide the water of the al-Disi Aquifer, evenly; and commit to joint water exploration efforts. Israel, Jordan and the Kingdom of Jerusalem will agree to build the Red Sea–Dead Sea Conduit; as in the Valley of Peace initiative. Saudi Arabia and Egypt will release rights to Tiran Island, this will be part of Israel; the Strait of Tiran will be the territory of Israel. Saudi Arabia will release rights to Sanafir Island, this will be part of Jordan; the maritime passage northeast of Sanafir Island and northeast of Tiran Island will be Jordanian and Saudi Arabian territorial waters; both will agree to open passage into the Gulf of Aqaba. UAE will agree to ratify the 1974 Treaty of Jeddah, as Saudi Arabia has done; Qatar will be an observer, co-signer of this agreement. UAE and Iran will agree on these islands, Abu Musa will be part of the UAE, and Greater Tunb and Lesser Tunb will be part of Iran. US will agree to raise economic aid to Jordon, Lebanon, Saudi Arabia and Syria; an overall 10% increase in monetary contributions. Egypt, the Kingdom of Jerusalem, Israel, Jordan, Lebanon, Palestine, Saudi Arabia, Syria will agree to a peaceful co-existence under these terms; and establish diplomatic relations; given full support of the US and sponsored by any nation or other elected body or party. Seeing as it concerned the transfer of Palestinians to this hypothetical designated state without their consent, and that Jordan was far from enthusiastic to allocate its own territory for the sake of a Palestinian state. Also, in 1988, Jordan gave up all claim to the West Bank and had took away citizenship of the Palestinians living there, this idea came to be seen as irrelevant by the majority of Israelis and Palestinians. Elon continued to advance his plan, including a 2004 visit to Jordan for this purpose, but did not manage to win substantial support for it. Semite: A member of a group of Semitic-speaking peoples of the Near East and northern Africa, including the Arabs, Arameans, Babylonians, Carthaginians, Ethiopians, Hebrews, and Phoenicians. © Copyright 2014 All rights reserved. The research described in this document is in the public interest and was supported by information gathered from various sources. The opinions expressed in this document are strictly of the author. May 11, 1949: Israel is admitted into the UN. This is conditional on Israel’s acceptance and implementation of resolutions 181 and 194. These resolution granted UN control over Jerusalem and for the return of Palestinian refugees. Resolution 181: United Nations Partition Plan for Palestine; Resolution 194: defined principles for reaching a final settlement and solving the refugee problem in the region. May 12, 1949: Lausanne Protocol – the Arabs and Israel signed. By signing the Protocol, countries recognized the Resolutions 194 and 181. The parties signed a joint protocol on the framework for a comprehensive peace, which included territories, refugees, and Jerusalem, in which Israel agreed “in principle” to allow the return of all of the Palestinian refugees. June 2, 2014: Palestinian Unity Government of 2014 was formed after an agreement between the Fatah and Hamas parties; a national and political union formed under Palestinian President Mahmoud Abbas. The new government was recognized by the European Union, the United Nations, the United States, China, India, Russia and Turkey. Exodus 23:31 (KJV) And I will set thy bounds from the Red sea even unto the sea of the Philistines, and from the desert unto the river: for I will deliver the inhabitants of the land into your hand; and thou shalt drive them out before thee. My Peace Plan meets these requirements: Israel would span from the Red Sea, with coasts on the Gulf of Suez, the Gulf of Aqaba and to the point of the former Sinai Peninsula, on the coast of the Red Sea. Even unto the sea of the Philistines; in the Bible, the Mediterranean Sea was also known as the “Sea of the Philistines” (Exod. 23:31), from the people occupying a large portion of its shores near the Israelites. So, Israel would continue to have a northern coast on the Mediterranean Sea. 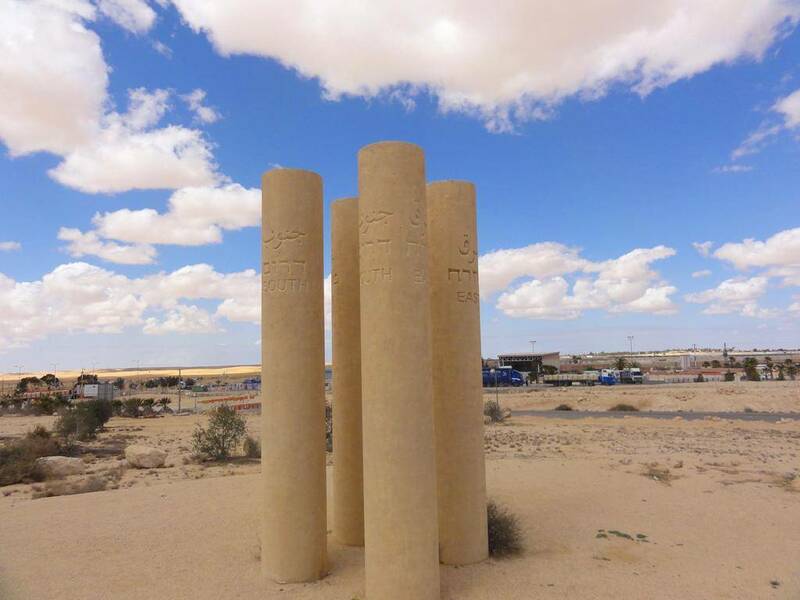 And from the desert, the desert is the Negev Desert, and now would extend to the southern-most point of the Sinai. Unto the river, unto implies north from the Negev Desert to the Jordan River. Prophecies would be fulfilled. The Torah does not record the Philistines as one of the nations to be displaced from Canaan. In Genesis 15:18-21 the Philistines are absent from the ten nations Abraham’s descendants will displace as well as being absent from the list of nations Moses tells the people they will conquer (Deut. 7:1, 20:17). God also intentionally directed the Israelites away from the Philistines upon their exit from Egypt according to Exodus 13:17. In Genesis 21, Abraham agreed to a covenant of kindness with the Philistine king Avimelech and his descendants. The Battle of Aphek is a biblical episode described in 1 Samuel 4:1-10 of the Hebrew Bible. During this battle the Philistines defeat the Israelite army and capture the Ark of the Covenant. After the Ark had been among them for seven months, the Philistines, on the advice of their diviners, returned it to the Israelites. The Israelites and Judahites have had four autonomous nations in this land, and have lived in this area for a period of 3285 years, if not more. The Philistines and Palestinians have lived in this area for a period of 3,191 years, if not more. Only 94 years less than the Israelites and Judahites. So, the Palestinians and Israelis, both, have thousands of years of history in this land. With this plan, there would be no more dead-lock for the zealots in Christianity; compromise is required for the second coming to be possible. There would be no more complaint of Judaism, would be no further need for the bully Israel, no more criticism, only praise and admiration. The Muslim nation could begin to truly live in Islam; a return to enlightenment; this plan is required for the coming of the Mahdi, Isa (Jesus) and Dajjal, and Yawm al-Qiyāmah in Al-Quds. For the Messiah to return through the East Gate and walk straight into the temple, For Jesus to come back on the Mount of Olives and walk through the East Gate – and there must be a bridge built, as it once was by the Romans, across the Kidron Valley, above the cemetery in front of the Eastern Gate. These are the beliefs of the three Abrahamic religions and the proposals in this plan will meet these goals. Thank you for considering World Peace.